Click here to learn how (not) to trash a cal kit! Network analyzers fall into two categories. Vector analyzers are capable of measuring complex (magnitude and phase) reflection and transmission; scalar analyzers only measure magnitude. Then the first automated network analyzers were introduced. A minicomputer (about equal to a 1000-watt, five-dollar calculator) grabbed the vector data from the 8409, and did some fancy manipulations that resulted in automatic error correction and accurate magnitude and phase of the four S-parameters. It was considered magic. The next step was to build the error correction into the test equipment (no external computer) and display the error-corrected measurements in nearly real time (the original HP 8510, circa 1982). Today, vector network analyzers are all automated (error correction is built in). And the acronym ANA has stuck. This type of network analyzer consists of a sweep oscillator (almost always a synthesizer so that measurements will be repeatable), a test set which includes two or more ports, a control panel, an information display, and RF cables to hook up your DUT. Often each port of the test set includes dual directional couplers and a complex ratio measuring device. Other options include a means for bias voltage/current injection, and a computer controller to manipulate and store data. 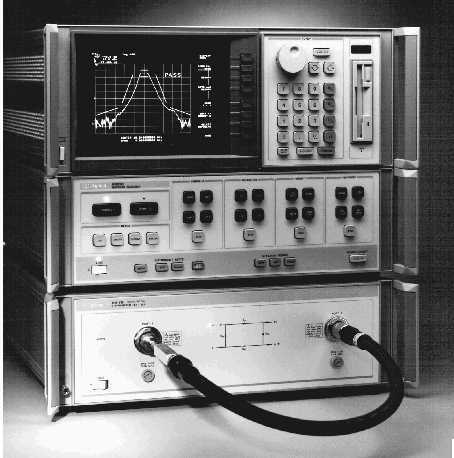 The "classic" vector network analyzer of recent history is the Keysight (Agilent or HP) 8510, shown below. It is no longer sold but many are still in service as they were built to last a lifetime. Depending on how much you spent, this analyzer can make measurements from 45 MHz to 110 GHz. Note the handy 3.5 inch floppy drive ready to record your S-parameter data! We're about to drop a lot of VNA knowledge on you, and it's totally worth the read. But for those of you who maybe have work to do, and just want someone to tell you what to do, check out this video from our friends at Keysight. In it, Franz Sischka from SisConsult chats about network analyzer basics and describes some best practices for getting accurate S-Parameter measurements. Twelve and half minutes well-spent! Before you jump into the nitty-gritty of vector network analyzer measurements, it is a good idea to familiarize yourself with vector error correction—often referred to as calibration. Vector error correction is the process of characterizing the systematic errors of the network analyzer system by measuring known devices called calibration standards. Subsequently, the effects of the characterized systematic errors are mathematically removed from raw measurements. In this way, the network analyzer system can provide measurements on devices with an accuracy that exceeds the raw performance of the network analyzer.There are many types of calibration techniques, and even more types of calibration standards. A typical calibration will move the measurement reference planes to the very ends of the test cables. You will have the choice of calibrating for one or more ports. Modern calibration techniques facilitate accurate measurements with a minimal set of connections. For example, it is possible to calibrate a multiport system without having to connect a through between all possible combinations of test ports. In general, depending on the test port connectors used, one or more of the test ports will need to have reflection calibration standards connected to them, followed by n-1 through connections where n is the number of test ports. Historically, there have been multiple calibration methods developed. For now, we will limit ourselves to a two-port analyzer, but the concepts extend to multiport analyzers as well. Perhaps the simplest two port calibration algorithm to understand is the Short-Open-Load-Through (SOLT) calibration. This consists of one-port measurements of each of the test ports using a known shorted termination, open termination and load termination. The last measurement is of a known through connection between the two ports—usually this is accomplished by simply connecting the two test ports directly to each other. The reflection calibration measurements are used to characterize the directivity, source match and reflection tracking for each test port. The through connection permits the characterization of the forward and reverse transmission tracking as well as the load match for each port. It is important to note that the match at a given port is not constant. When the analyzer is set up with dual reflectometers on each port, it is possible to use the hardware to measure the signal that comes either from the source or that which is reflected off the terminating switch, depending on the sweep configuration. Many calibration algorithms such as Through-Reflect-Load (TRL), Short-Open-Load-Reflect (SOLR), and Quick-SOLT (QSOLT) assume a constant port match. These are often referred to as eight-term error correction methods. The eight terms are directivity, reflection tracking, port match for each port and transmission tracking in both directions. You will also hear of twelve-term error correction methods which account for having a different load and source match for each port (two terms)and for crosstalk in both directions (two terms). In reality, crosstalk characterization can be applied to eight-term calibrations for a total of ten terms or can also be entirely omitted.... For most tasks you will probably calibrate both test ports for reflection and transmission, which will allow you to measure full two-port scattering matrices (S-parameters for your device under test (DUT). What frequency range do you need to measure? Does the cal kit, cables and any adapters you need operate over the desired band? Are the cables in good condition? (Connect them together and see what the effects of gently bending them have on uncalibrated transmission and reflection parameters). Will the cables reach the DUT? (This seems obvious, but I have seen people waste time calibrating only to discover that the test cables are too short to reach both ports of the DUT). Note: cable management is a very important, but often an overlooked aspect of network analyzer measurements. Cable movement during and after calibration introduces variation that is not characterized during calibration which results in degraded measurements. Consequently, you should constrain the cables in a fixed position defined by the test port topology of the device under test (DUT). As frequency increases, the effects of cable movement become more significant. Oftentimes, the SOLR calibration method becomes very useful because the only requirement of the through standard used during the calibration is that it be reciprocal (S21 = S12). Thus, if needed, a bent cable can be used as the reciprocal device. In many cases, the DUT itself can be used as the reciprocal device. There are multiple calibration techniques. Several of these techniques (SOLT, QSOLT and SOLR) require reflection calibration for one or more of the test ports. SOLT is probably the best known calibration technique, which consists of a one-port calibration on each test port followed by a known through calibration between the test ports. QSOLT or Quick SOLT requires a reflection calibration on one of the ports followed by a known through calibration. SOLR requires reflection calibration at each test port followed by an unknown through calibration between the ports. The unknown through calibration standard is a reciprocal device (S21 = S12) with an arbitrary reflection coefficient on each port that doesn’t need to be known. The SOLR calibration permits calibrations where the test ports may be non-insertable due to either connectors that don’t mate or DUT topology that doesn’t permit direct connection between the test ports. The reflection calibration for each port requires three or more standards, typically: an open circuit, a short circuit, and a matched 50-ohm load (for waveguide calibration, a pair of offset shorts and a load are used. An open in waveguide usually acts more like a load due to radiation). The matched load can be a "broadband load", meaning that it has very low reflection coefficient over a lot of bandwidth, or a sliding load. Sliding loads are an expensive and fragile standard which should only be used if your measurement requires great accuracy (perhaps you want to be able to tell the difference between a 1.01:1 VSWR and a 1.02:1 VSWR). The sliding load recognizes that a "perfectly matched" 50 ohm calibration standard can never exist, but a series of loads with equal mismatch but varying phase can be used to draw a circle around the actual raw directivity of the system, thereby permitting the raw directivity to be characterized. My advice to you: unless someone takes the time to show you how to use the sliding load properly, NEVER TAKE IT OUT OF THE BOX. A new calibration “kit” to consider is the Ecal electronic calibration device. This device can characterize a test port using a single test connection rather than having to connect multiple devices. Ecal has multiple characterized device states—conceptually, you can consider the Ecal as a test termination that supplies the “open”, “short”, and “load” terminations to each port as well as a known through connection between the ports. The characteristics of the provided termination states are known and stored in the unit. The network analyzer communicates with the unit to both drive the internal states as well as to obtain the characterization of those internal states. The particular set of calibration standards (and test cables) that you use will depend on what frequency band you need to cover. Coaxial calibration kits come in multiple versions to allow for different connector types including: type N, 7 mm, 3.5 mm, 2.92 mm, 2.4 mm, 1.85 mm and 1.0 mm. There are waveguide calibration kits for every waveguide band. Be sure not to exceed the frequency capability of the test set, cables, adapters and calibration kit (see our section on connectors for the frequency limits of different connector types). Sage Advice: remember that cal kits are expensive, and pieces of the cal kit should NEVER be used as adapters or loads in any test set. And always put the little plastic covers onto the calibration pieces. You want to prevent dirt, skin, grease, etc. from degrading the accuracy of future calibrations. We have a separate page on how (not) to trash a cal kit! Users often think they can verify the validity of the calibration by measuring a through connection. If the through connection was used as a known through standard during calibration (SOLT and QSOLT) then the only information you can get is an indication of stability and repeatability of the measurement. The SOLT and QSOLT algorithms force the measurement of the through connection to look ideal. The transmission and reflection parameters should not vary significantly when you gently bend the test cables, or you have a bad connection. If you see an issue with the calibration you just did, figure out the problem before you perform another calibration, or you will be wasting your time and adding needless wear and tear to the cal kit and test cables. Some of the options the network analyzer allows need to be discussed so you will know how to answer them. Omit isolation: during the calibration, you can select the “omit isolation” option. If you are measuring the loss of some test cables and don't expect to see transmission data under -20 dB, go ahead and omit the isolation cal standard. But if you want to see the steep skirts of a filter or the reverse isolation of a multi-stage amplifier, you should perform the isolation calibration step. Most of the time, the crosstalk is below the noise floor and an isolation calibration simply adds noise to the measurement. For this reason it is important to increase the averaging factor when measuring the isolation standards. Averaging: performing averaging will improve the accuracy of your data by reducing the effects of noise. But it will slow down the measurement process noticeably, a consideration if you have a lot of data to collect in limited time. IF bandwidth: an option on most new network analyzers is to reduce the IF bandwidth to improve measurement accuracy. Try reducing from 35 kHz down to 500 Hertz. Smoothing: smoothing is cheating, no ifs ands or buts. Smoothing reduces the "bumpiness" of a frequency response by averaging data across a couple of frequency points and using the result at one frequency. But if you need to cheat to get some data for the boss who is standing behind you, go for it. The only time that smoothing may actually improve measurement error is in group delay mode (note: this is referred to as the "aperture" setting when you are using Anritsu [Wiltron] equipment.) The group delay is actually calculated from the slope of the phase angle versus frequency, and the "aperture" option allows the user to define the frequency band used to establish the slope measurement. Auto scale: go ahead and use the auto scale to quickly display visual information on the parameter you are investigating. But when you actually plot the data on a printer or use an Excel spreadsheet, use a scale that makes sense. Like 2 or 5 or 10 dB per division. NOT 3 or 6 dB per division. This is because we live in a base-ten world, not a base-three world. Also, when you are plotting the same type of data for units of the same type that you are measuring, use the SAME scale for all of them so they are easy to compare. Response calibration: this type of calibration offers a shortcut to data, but offers a reduced amount of error-corrected data. A transmission response calibration will merely measure the magnitude (insertion loss) and phase of the through connection, which will be removed from all subsequently measured data. But you won't know anything about the magnitude and phase of the DUTs reflection coefficients. A reflection response calibration will provide magnitude-only information for reflection coefficients. If you find yourself using the response calibration feature often, you should consider using a scalar analyzer and stop tying up the expensive equipment. Scalar network analyzers are so lowly that they don't have an acronym. So you have to say at least "scalar analyzer" or no one will know what you are talking about. The obvious difference between a vector network analyzer and a scalar analyzer is that the scalar analyzer doesn't give you any phase information. It only detects power. We are still working on this section, so check back later!! !